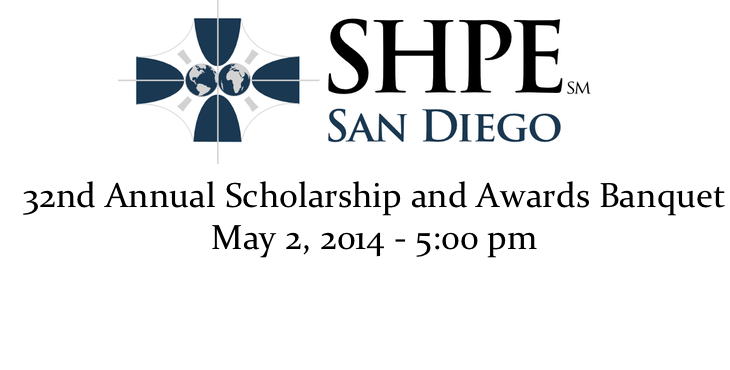 You are cordially invited to attend SHPE San Diego’s 33rd Annual Awards & Scholarship Banquet “Celebrating STEM Stars” on Friday, May 1st, 2015 at 6 PM. A celebration of SHPE San Diego’s corporate partnerships, community and education leaders, accomplished students, and our bright future STEM innovators. Join us for an extended hosted reception (including Mariachi) with bar, seating and food action stations followed by our program in the Qualcomm Hall, and wrapped up with coffee, dessert, and networking in the lobby. Early Bird tickets are available until 9 PM on April 25th at $50 for professionals (and their guests) and $25 for students/parents/chapter advisors/guests. Our Keynote Speaker will be Juan Faus, Retired Qualcomm Manager and Past SHPE San Diego President. Our MC for the night will be Heidy Arriola, Region 2 Vice President.